The ThINKin' Spot: Peachy Keen Stamps March Mid-Month Release Blog Hop! You should have arrived here from the amazingly talented Amber Kroening’s Blog. if you’re hopping along in the set order, but if you just happened upon this post then you can go back to the beginning at The Peachy Keen Stamps Blog and start from there so you don’t miss one wonderful project. Grab your favorite beverage and relax with us for a few minutes as you take in the talents of our team, and be sure to leave comments along the way for a chance to win all four sets in this release! That’s right!! One lucky person who hops and comments with us today will win all four of these sweet stamp sets! 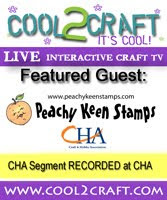 Winner will be announced on the Peachy Keen Stamps Blog tomorrow. Thanks for joining us today and ENJOY THE HOP!!! I had a lot of fun with the card I'm sharing with you today. Working with great stamps like these, make it pretty hard NOT to have fun!! I colored this adorable Faceless Chicken with my Copic Markers. I added some sparkle to those cool shades with a Spica Black Glitter Pen. The cool shades, chicken wire background and sentiment are from some of the new sets that are available TODAY on the PKS website. Stop by there to see ALL of what's new, and what we're so excited about! The patterned paper is some from my hoard of Daisy D. paper, which is no longer available for sale. I'm going to be so sad when I use all of this up, because I LOVE it!! I stamped the chicken wire background right over the patterned paper, which gave it a different effect. The doily was cut with my Sizzix doily die that I purchased from Stampin' Up!, and the sentiment was cut with the banners dies from Stampin' Up! as well. For embellishment, I added the sequins and ribbons which are a great contrast to the shabby theme of the rest of the card. I think that about wraps up this hop! Have a wonderful day and happy stamping!!! Awesome card Lorie I love it. Everyone is doing such a great job on this hop. I love it!!! Whoa, Lorie, your coloring is amazing! Love the scattered sequins and your cool chickie. You have the CUTEST chick on the block....LOL!!! My goodness your coloring blows me away!!!! Such an adorable card Lorie!!!! Gorgeous! Love the colors and your coloring! great card and especially your coloring! This has been a fun hop! Gorgeous, love the colouring and colours!!! The darker papers really make the chick pop. Love all of the layers. Great card. I love the design of your card! It is so cute!! Absolutely gorgeous card. .I love all the amazing rich color and stunning details on the card. I love your card. It has all the best: shabby, chic, color, old and new. Just adorable. This is so cute, I want to color like you, that chick is perfect!! You have wonderful coloring skills! I can't stay in the lines, if my life depended on it! LOL! Love those sparkly shades! Hehehe!!! This is the cutest darn card!! And yes I agree, it's hard to not have fun with all the delightful stamps from PK! And you have showcased some of them wonderfully with this fantastic creation! Absolutely adorable and thanks so very much for being a part of such a fun and inspiring blog hop! I've had a most awesome time!!! OH MY! Lorie!! Your coloring IS AMAZING... this Card is TO DIE FOR... PERFECT in every way! I love ya to the ends of the earth! I love your card Lorie. It is too cute. TFS! Cute! Love that ribbon too! Beautiful card Lorie!! Love the layering and the look of the chicken wire stamp over the patterned paper. You coloring is perfection....as usual. Fab project!! I love the coloring on this card. from the chicken to the paper used just love it!!!! Hi Lorie! Love your shading on that cool chick! Beautiful card and that bow is perfect!!! Wow, your coloring is amazing. The color combo with the barn red is great. Great card!!! Beautiful card! Love your use of the Copic coloring on the chickie! Your design is awesome! Lorie - this is a super cute card! Love the colors, patterns and the way you colored the background for the chicken. Such amazing projects in this hop! Love your card! Oh my Lorie, I totally adore this card!! Love the bold colors and all the layers and sequences and of course I am LOVING the stamps!!! lorie, your card is wonderful! I love your coloring, someday I'll learn how to color like that! Amazing coloring Lorie! Love all the details and layers you added to your card, is perfect! Love your card. All the papers and shading is great. This turned out to cute! I liked the idea of stamping the background stamp on printed paper. Looks Great! Love your card! I would have never thought to stamp a background over an already patterned paper. I love it!!! Awww, this lil chicknlittle is TOO CUTE! !